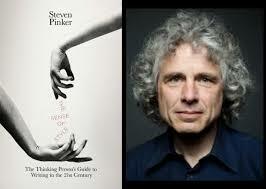 Steven Pinker tweets thirteen rules for better writing. Spotted via Boing Boing. Reverse-engineer what you read. If it feels like good writing, what makes it good? If it’s awful, why? Prose is a window onto the world. Let your readers see what you are seeing by using visual, concrete language. Beware of the Curse of Knowledge: when you know something, it’s hard to imagine what it’s like not to know it. Minimize acronyms & technical terms. Use “for example” liberally. Show a draft around, & prepare to learn that what’s obvious to you may not be obvious to anyone else. Omit needless words (Will Strunk was right about this). Avoid clichés like the plague (thanks, William Safire). Old information at the beginning of the sentence, new information at the end. Save the heaviest for last: a complex phrase should go at the end of the sentence. Revise several times with the single goal of improving the prose. Find the best word, which is not always the fanciest word. Consult a dictionary with usage notes, and a thesaurus. After absorbing these, read his The Sense of Style.